IDW is holding off on new issues until later on this month. Yet the buzz around the approaching story arc is that it will feature a new big bad. Having recently reviewed some villains I didn't find too impressive, I'd like to share my thoughts on why I'm looking forward to this particular baddie. Check out the full editorial after the break. 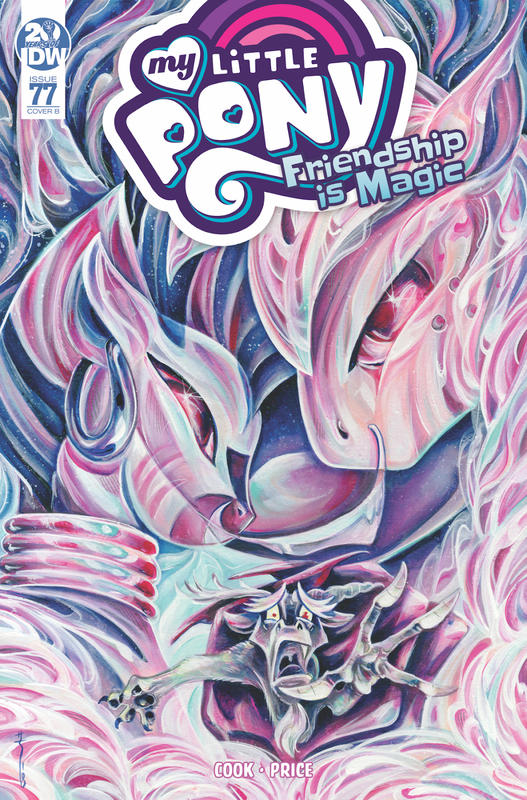 It will feature spoilers for MLP #75 and onward! So... Cosmos. A villain hinted at during New York Comic Con 2018 and in recent solicitations. 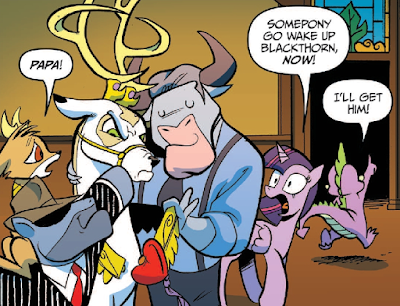 He's supposed to be an even greater threat than Discord. 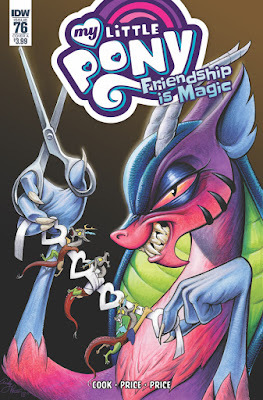 A bold claim, given that Discord has been a fan-favorite for a long time. The expectations are high, especially as Katie Cook returns to the My Little Pony issues to celebrate this 75th publication. Due to my retrospective reviews I've covered Cook's work and have expressed my views on some of the villains she's presented. 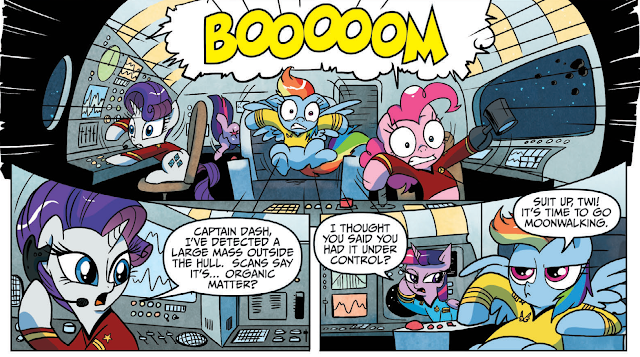 Having just recently covered The Good, The Bad, and the Ponies and The Root of the Problem I'm very aware that sometimes a villain just doesn't work. Yet seeing what didn't work in the past actually adds some optimism to what's approaching. That toy will progress to the dumpster. Before diving into Cosmos and my expectations, let's do a quick recap of three villains presented by Cook. The leader of the Cattle Rustlers is one of my least enjoyed antagonists. That's not to say I don't recognize his power. This is a guy who can plow through barbed wire, get lit of fire, and dash away laughing. He has tremendous physical strength that I think would make him a menace to the average earth pony town. isn't a fun story at all! Yet he wasn't facing average ponies. 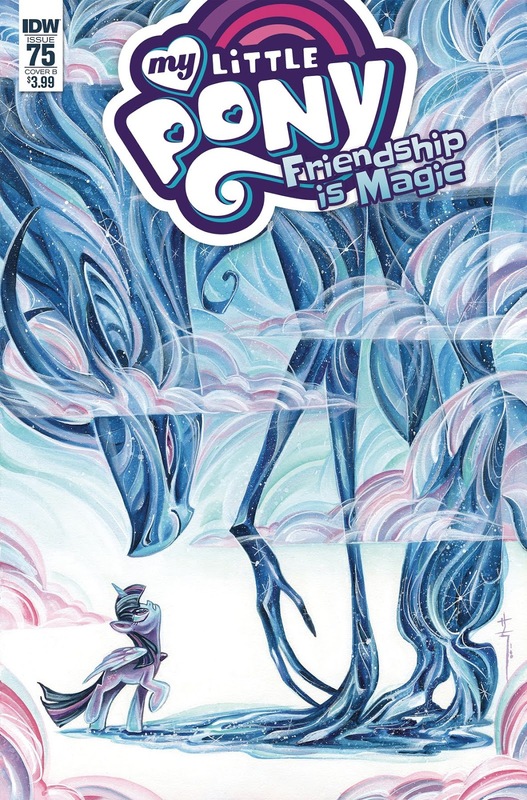 Against Twilight Sparkle, Longhorn should have been less than a roadbump. Like a schoolyard bully, Longhorn was only a threat as long as he kept his actions within a confined area. 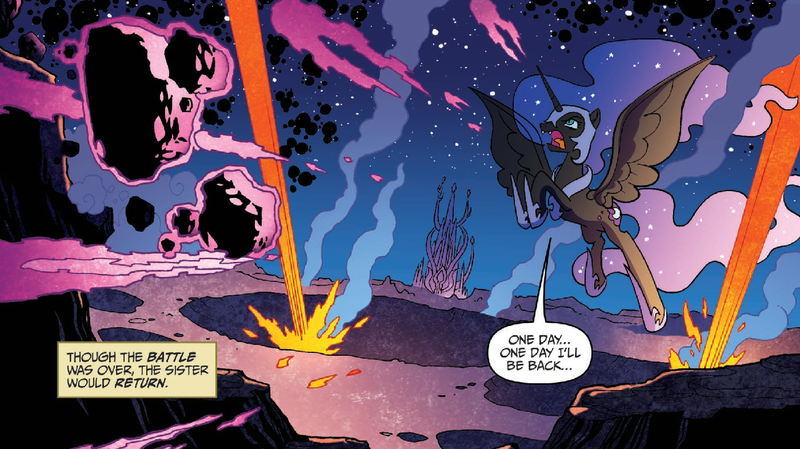 The moment he saw he was up against an alicorn, he should have taken stock of his abilities and cut his losses. This is why his campaign is more frustrating than tense. When Twilight gave herself permission to act, Longhorn couldn't even put up a resistance. One could argue the business-taur was not as physically powerful as Longhorn, though he had greater resources at his disposal. For the purposes of this villainous retrospective, however, none of that matters. The real advantage Well-To-Do had over Longhorn was the fact that he loved what he did far more, and was too dense to see anything else. You could, you know, paralyze them with magic. Or zap them. Why do they never zap the bad guys? Well-To-Do was so dead-set on profits and his idea of progress that he was beyond reason, threat, or any concept of consequence. His over-the-top portrayal of focus groups, merchandising, charts, and other business stereotypes was so extreme it actually could be charming. Still an antagonist but not out of pure malice. This speech may be the biggest "I'm gonna lose" signal in all of MLP. The moment Well-To-Do captured Prince Bramble, he stepped into a tier of villain that didn't suit him. 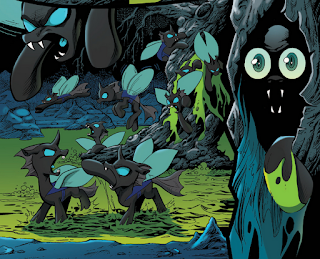 So of course when he led a clash against the Everfree Forest's residents he was trampled. Had he remained oblivious and served as a trigger for King Aspen's full range, I think he would have fulfilled his role in a much more comical and enjoyable way. As it stands, I've never been so pleased to see a pitch-black panel. He is not. And I'm okay with that. I hope Cook enjoyed writing the Queen because I loved reading it. I'd argue that Cook's portrayal is stronger than the show itself. 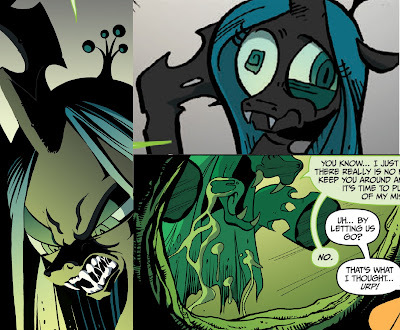 Chrysalis in the comics is a powerful enemy who knows the harm she inflicts and isn't just unapologetic. She's celebrating her cruelty. She loves what she does and wouldn't have it any other way. Yet she is often surrounded by incompetent subordinates or annoying hostages, so she has more than a few frustrated moments. The many faces of Chrysalis. All of them true. It's this blending of menace and comedy that makes her so fun to read. Rather than being contradictory like Well-To-Do, the sillier moments serve to highlight when Chrysalis issues a threat. The queen of deception lulled us into a moment of enjoyment before reminding us that she is–first and foremost–a monster. I often celebrate Cook's stories when they focus more on characters and their flaws rather than larger-scope battles. This is in part because a character at war with themselves leads to a believable story. When villains like Well-To-Do and Longhorn are presented as threats, we look at the ponies they oppose and realize this shouldn't be a contest. It's only the ponies' inaction that allowed these villains to gain any momentum whereas Chrysalis had the resources and power to make the ponies appear desperate. Which leads us to Cosmos and the question of his power. Without any knowledge of his actions I can already assume he's very powerful for one fact: this story is set to take place in space. Consider the vast power it takes us just to span the 225,623 mile distance to the moon. That's at its perigee; the closest it ever comes to the Earth. We've yet to move past this milestone despite the probes we launch to see what can't be reached. this does show that even Nightmare Moon couldn't overcome space's void. Space's vast distance adds a credibility to an invader's power. If they can traverse the cosmos and still have the energy to threaten others, their power is something amazing. That doesn't even begin to cover the psychological impact. There's a theme running through many of my favorite Sci-Fi stories. Alien, Star Trek, even Dragonball Z. At some point the lead characters come face-to-face with a threat far beyond what they imagined. It drives home this idea that we exist on an island of ignorance. We try to leave this safe area and are easily swept away by forces greater than we expected. After that, it's understandable that some would never want to test the limits again while others would force themselves to go further. I'm curious to see if this idea will be part of Cosmos' introduction. There's a lot of risk in saying a new villain is even more dangerous or powerful than Discord, but it's not impossible. What better place to find such a threat than far outside the familiar world? Now there's a tough question. We've seen Jeremy Whitely offer a different take on a chaos spirit with Eris in Nightmare Knights. She doesn't have Discords sense of whimsy and is more openly sadistic. I'm not sure where Cosmos might stand. Power enough to eclipse Discord, but will he be serious or flippant? A combination? Flippant while being monstrous. This is what made Chrysalis so fun. I'm not putting much stock in the covers we've seen thus far because a cover is not meant to summarize the story. In fact, many a cover from Marvel and DC has flat-out lied to the audience to encourage them to buy the comic. I'm am intrigued by Cosmos' design but not buying into the action presented. Not yet, anyway. Yet there is one thing I hope Cosmos does not do. It's a critique I've witnessed in The Last Jedi and with the Storm King. Those villains lost their tempers and raged even while having the upper hand. I've found that the most impressive villains will act disinterested or calm because they know they're in control. Composure signals power and when a villain loses that without prompting I sense a bad presentation coming. One other aspect is how many characters will have to rally to stop Cosmos. We've already got a nugget of info that Zecora, Big Macintosh, and the Crusaders will be a part of this quest. 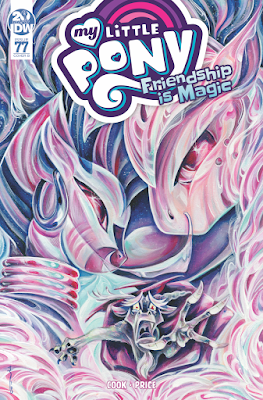 Sadly, we also know that the Princesses will once again be sidelined, which seems unnecessary if Cosmos is so powerful. What better way to validate a threat than to show several alicorns rallying against it? One day I hope to see the alicorn princesses rally rather than await rescue. Yet a larger cast set against a single villain does speak to a greater power. And that's why I think Cosmos will be more enjoyable. If he's as powerful as the situation implies, then there's no need to place limiters on the protagonists or have them stand idle. We have a villain to who could genuinely drive the story. Perhaps it could go south, as is possible in any tale, but I'm looking forward to the journey and I hope you are as well. They're going into space. Please tell me we'll have some sci-fi references!